When opening a new page in Safari for iOS, the first thing seen is the “Favorites” page, which is basically a collection of website recommendations and bookmarks. That Favorites page is what you see when you have no active pages open in both normal and private mode, and also what you see when you tap the [+] button to open a new webpage in Safari. 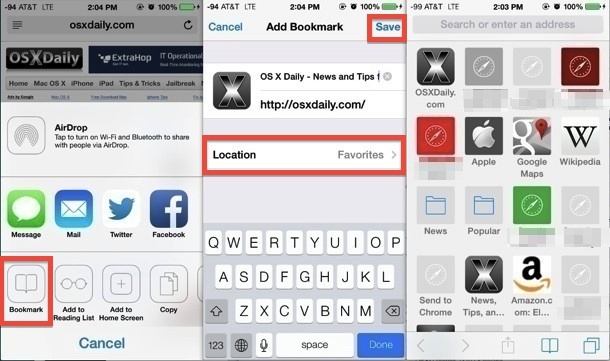 If you find yourself visiting certain websites often (you know, like this awesome one right here) then you can easily add a bookmark to that Favorites page, making for super quick access anytime you open Safari. You can also easily edit what’s on that favorites page, customizing it to include only the links you want to see and access. Making these simple customizations turns the Favorites page into a sort of web-specific home screen, and it’s easy to do. Note that if you don’t see the share icon and back/forward buttons, you need to tap on the URL. Don’t double-tap it otherwise you’ll summon the on-page text search feature. That can be a little confusing at first, but once you get the hang of it, it’s simple, and it’s the same in Safari for any iPhone, iPad, or iPod touch running iOS 7.0 or newer. After sites and web pages are added to the Favorites page, you can edit them, or you can move existing bookmarks onto the Favorites section too. You can think of the Safari Favorites page as a home screen to the web, but rather than apps each icon is a website. Don’t forget to add OSXDaily to that list, and maybe even put us on your home screen if you visit as often as you should. Great tips, as always. This is a good site, but the obtrusive advertisments that obstruct my ability to read them makes me not use my iOS devices on it and it’s been removed from my bookmarks. It’s not good idea. When iPad is synchronized with a MacBook you can see many iPad favorites as tabs in safari on this MacBook. When you delete the tabs in the MacBook, the iPad favorites disappear. What I would like to know is how to edit and add your icon to the iOS Favorites sites. For some reason it keeps reversing to a blank icon. 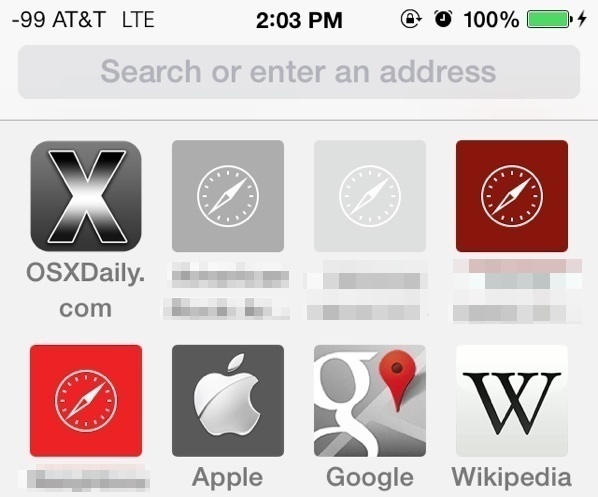 Or better yet, How do we add icons to the favorites in Safari for iOS.